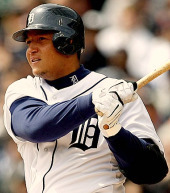 Home » 09-10 Offseason » How About Miguel Cabrera? While we wait for Jason Bay to make up his mind about playing in Flushing, we may as well consider other alternatives. During a “hot stove huddle” a few days ago, a rabid and intelligent Mets fan named “Kevin K” proposed that Omar Minaya make a deal for Miguel Cabrera. The more I think about it, the more it makes a lot of sense. While many eschew him for his weight issues, sloth-like movements in the field, and questionable effort, there’s one thing about Miguel Cabrera that cannot be dismissed: the man can flat-out HIT. Cabrera is a younger (26) and more versatile version of Manny Ramirez, and fits the Mets needs in so many ways it’s silly. He can play first base, third base, and left field with equal mediocrity, and has the mash-factor necessary to assume the cleanup spot. His career batting average is well over .300, he’s played 157+ games for the past 6 seasons, his power cannot be contained by any ballpark, and he’s a lock to post a .900+ OPS. I can’t think of any reason why the Mets wouldn’t want him. The question, of course, is whether he’s available. Considering that the Tigers are in budget-clearing, rebuilding mode, you’d have to believe they’d at least listen to offers. Cabrera is about to enter year three of an eight-year deal, and his salary jumps from $15M last year to $20M in 2010. All told, he’s due $125M through 2015 — when he reaches the ripe old age of 32. That’s a considerable amount of dough for a struggling franchise to swallow, and if Detroit found it necessary to shed the $24M owed to All-Star Curtis Granderson over the next three years, you’d have to think they’d be looking to move Cabrera’s monstrous contract. And who knows, they might even be willing to take on Luis Castillo’s comparably tiny commitment as part of the deal — with Placido Polanco fleeing to the Phillies, they are in need of a second baseman, after all. Perhaps the Mets would have to also take on Dontrelle Willis and his $12M, but wouldn’t it be worth it? Maybe Willis could make a comeback — it wouldn’t kill the Mets to have another lefthanded pitcher in the organization. What would the Tigers require in return? Presumably, young, cheap players who are nowhere near free agency. That likely means Dan Murphy, Fernando Martinez, Jon Niese, and Bobby Parnell at minimum. Or perhaps one of that group is replaced with Brad Holt or Jennry Mejia. Maybe the Mets could also wrangle away catcher Gerald Laird or former catcher Brandon Inge as part of the trade — would that sufficiently sweeten the deal for you, particularly if Luis Castillo can also be sent to Detroit (opening 2B for Orlando Hudson) ? Such a trade would be creative, out-of-the-box, and unexpected. It would also give the Mets the slugger they need — someone who is entering their prime rather than exiting it. The cost would be substantial, but in my mind, well worth it. Next Jason Bay: No News is Good News? Okay I am one of the most vocal “don’t break up the Mets farm system yet again” proponent on this blog. But Joe, I cannot in good conscious see a reason not to give Detroit Ike Davis or FMart, Holt or Niese, Murphy or Pagan, and one of the low A ball top prospects to Detroit for a 26 year old Pujols-light(…heavy?). Maybe that deal wouldn’t get it done, but I’d offer it to start with and work it out from there. I’d give up Davis but I do not know if they have a 1B/RF prospect that would block his way (Miggy is primarily a 1Bman or LFer, but since we don’t have a LF prospect I’d part with Davis, though I know he may end up in RF eventually). The biggest hurdle for me is how much pitching to give up. If some other player came along in the deal like a Willis or a catcher I would give up one of my better pitching prospects, but not Mejia. In short I think it is agreeable that Miguel Cabrera is worth most any prospect you give up. I think he is young enough that he can slide into the Mets core and build a championship around along with Wright and Reyes. The key here is giving up something to get something. DET traded Granderson so they could keep Miguel Cabrera I believe. That said the DET economy isn’t “hoax & changing” anytime soon. The Tigers would need valued in return. Murphy fills the immediate void at 1B but Ike Davis would be the lynch pin to a deal for Cabrera. When Davis comes up Murphy moves to DH where he could become Edgar Martinez 2.0. Castillo would be the payroll trade off as you said allowing for Orlando Hudson to fulfill his dream of becoming a NY Met…or…expand the payroll swap and send Oliver Perez (12m-12m) to DET as well and take back Carlos Guillen (13m-13m). Being a former SS perhaps he could become a 2B option. A pitching prospect like Holt or Neise could round out the deal. The Jason Bay offer could then be pulled and a short term option like Jermaine Dye for a year plus an option could be explored. F-Mart should be ready in 2012. Funny you should mention Miggy and Dontrelle in the same post. I’m gonna be a bit of a homer here. I’ve known both players since they joined the Marlins. In fact, both have broken bread at my table. Miggy’s hit in the cage in my backyard and each have graciously taken the time to attend and instruct more than a few of my travel baseball team’s practices down here in Palm Beach. Although they’ve recently has some issues, I will tell you that they’re both good guys at heart and would welcome the opportunity to play in New York. Seriously. From a talent standpoint, Dontrelle is a fierce competitor, has a deceptive delivery and swings a big stick. He’s also a great guy in the dugout and clubhouse. Dontrelle’s the same age as Ollie, makes the same money and has had a better career. If he’s healthy again, in my opinion he has more upside than Perez. I’d be willing to take the risk if the deal was right. As for Miguel, the only players that compare with his offensive numbers since the beginning of his career are Pujols, Ted Williams, Mel Ott and Ty Cobb. That’s pretty good company. With the hot stove season burning, Omar should definitely check out Dombrowski’s agenda. There could be a great fit in there for the Mets. Hmmm…. I like all of these ideas, but the trades you all propose are too much for Miggy…. remember, he is properly valued at $20+M / year. That is, lose the talent and lost the cost = break even. Now, the Tigers won’t give him away for nothing, but remember you don’t have to pry him away with talent… all you have to do is outbid everyone else. Everyone else = Yankees, Sox, Angles, Dodgers (i.e. those with the cash to pay him). However, Yanks have Tex, and not sure Sox are willing to make the adjustment (just signed Cameron). So this seems to be the biggest hurdle to getting the deal in motion: not enough bidders = low value return for Detroit. I’ll bet they hold on to him and try next year when the market opens up a bit. But definitely worth a shot! Go Omar go! I would love to have Cabrera but I would not be in favor of handing over the farm. The man is a risk, his defense leaves alot to be desired, he costs a fortune and if his D gets any worse he’s going to have to become a DH which means we’ll have to find a trade partner eliminating 1/2 the teams. If the Tigers really want to get rid of him (which I doubt) or his salary (probably) and no one else will take him off their hands then why would we have to send alot of young prospects to help them out? I’ve been thinking about this possibility since rumors started weeks ago. Cabrera’s weight shouldn’t be a problem: See Babe Ruth, Tony Gwynn, etc. Do it. Detroit’s economy has been destroyed. It won’t take giving up a ton of talent if the Mets can relieve the Tigers of $20 MIL in payroll. Add another decent starting pitcher and the Mets can compete in 2010. I’ve wanted to do an Ollie-for-Dontrelle swap for a month or two now. Not sure what it would take to get Miggy in the deal, but seeing (as others have pointed out) that Detroit has received more than its share of the economic “downturn” (put mildly), they may not be able to fill the seats. Plus, trading for Miggy and Dontrelle just might give us fans the impression that the Wilpons really are serious about improving the team, and maybe do know what they’re doing. Is he definitely the kind 0f trashy human being that should come to work for the Wilpons? What a class baseball man. The last weekend of the season, the playoffs on the line day game coming up the guy goes out drinking with the other team until 6 AM then goes home and has a fight with his wife. Takes a blood alcohol test and its only .26!!! Its amazing nobody is dead becauseof him. You want this guy??? And to the guy who says he’s really a good guy. Bull. Any guy that beats on a woman is not a good guy at heart. After you bring him in don’t forget he will need someobdy who understands him so make sure you go and get Myers. They’d be great together and maybe if the world is lucky they’ll beat each other up instead of women. Good to see that you’re capable of judging a guy based on a media report that you read. It’s also good to know that you’re judging one of baseball’s elite players based on one night in his career. For the record, did you know that the wife went ballistic and hit him first, ripped the chain off of his neck and threw his cell phone against a wall? Did you know that he was not charged by the police? Did you know that later the wife publicly stated that she was wrong and she was the aggressor? Here’s some more facts; last season Cabrera hit .323 with 33 HRs and 101 RBIs. His career line is as follows: .311/.383/.542 with an OPS of .925. You’re entitled to your opinion. But if it was up to you, the Mets would have never won the WS in 1986 as you would’n have wanted more than HALF of those players on your team either. the huge contract at 20m per year. imho the wilnots don’t want to spend money on anyone..if they really wanted bay, they could have signed him a week ago.but don’t worry, omar says he has a plan..
catchdog: In case you don’t know it police reports are public records. Don’t you feel good berating a lady half the size of this drunk big man, saying she attacked him. Well, buddy, you come into your house at .26 at 6 AM and your wife should stike first before you kill her. Do you have any inkling how drunk .26 is? No you don’t. And you know what person who has no knoledge of spousal abuse. Abused women lie all the time. You know why. FEAR. FEAR and more FEAR. The police filed no charge because they couldn’t determine who the aggresor was. Abused spouses rarely are willing to go to court and testify in a publiuc forum. That doesn’t mean crap on the man’s defense. Myers had the charges dropped because his wife testified she didn’t want to pursue a criminal case.. I guess if the Mets sign him you’ll be in denial about him beating her up in the street because the charges were dropped. As for his average, who cares. There are plenty of decent folks in baseball who can help a team justr as much as guys like him. It’s obvious that you are in denial regarding the FACTS reported. That said; you bring nothing to the table but your opinion and generalizations. Plus, you show how ignorant you really are by asking and then answering foolish questions such as: “do you have any inkling how drunk .26 is?” Guess I missed that COPS episode. Moreover, it must be a FACT that “abused women lie all the time.” Nice generalization. And how exactly do you construe my post as “berating a lady half his size” and then making the remark “don’t you feel good?” Again, I reported FACTS from the case. Furthermore, guessing that I’ll be “in denial” with regard to the possibility if the Mets were to sign Myers, is again, well… guessing. Myers has NOTHING to do with this story. What’s next? Guessing how I feel about Elin and Tiger??? You made one factual statement and that was repeated from my previous post; no charges were filed because the police couln’t determine who the aggressor was. You may want to read that again without adding generalizations, speculation and conjecture. For what it’s worth, every other post on this subject is in favor of the possibility of acquiring Cabrera. As stated in my first post, I personally know Miguel, along with his wife; Rosangel, and wish only the best for both. However, if you’re going to be arrogant and ignorant towards my opinion and the facts involving the case, then I suggest that you either deal with it or straighten out your skirt. i’m not even convinced that we’d need to give up as much talent as you’re suggesting, joe. miggy + dontrelle is a huge financial weight around detroit’s neck. i think the biggest problem is whether we can afford these guys and still plug up the restof the holes. This trade makes to much sense. Don’t you know the Mets make deals that don’t make sense. I think a more realistic deal would be trading F-Mart and Ike for Brandon Inge and Gerald Laird. We don’t have enough catchers in the organization. Also we would sign Bengie Molina.